The Investment Banking Services Price Index (IBSPI) increased by 11.9% in 2017, following a 2.8% decrease in 2016. 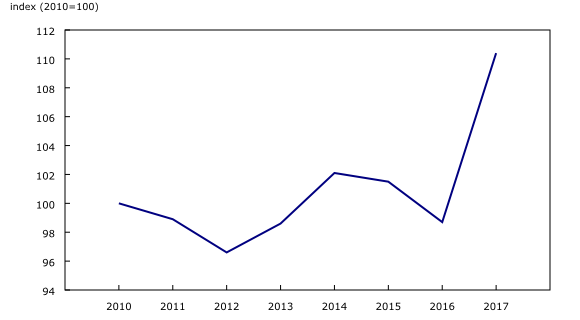 The increase in 2017 was attributable to higher prices for services related to facilitating the issuance of corporate ownership securities. Specifically, services related to underwriting non-resource sector corporate ownership securities, the most heavily weighted component of the index in 2017, were the main contributor to the increase in the index. The Investment Banking Services Price Index is an annual release. The index collects prices for underwriting activities that are used to measure price movements over time in the investment banking industry. With each release, data for the previous year may have been revised. The index is not seasonally adjusted. Data are available at the Canada level only.